Get your hands in a real St. Croix experience on our organic farm. We were recently featured by the Travel Channel as one of the top 10 US farms to work and stay. Have access to fresh foods. Relax in a safe, spacious environment. Experience true off-grid living and enjoy your own unique farm stay experience. 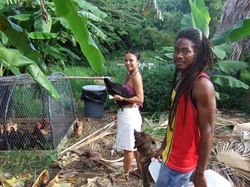 In the Northwest mountains of St. Croix USVI, you will find a unique jungle-like getaway like none other in the Caribbean: where you can immerse yourself completely into the rainforest, cucooned by vibrant life all around, on a productive Farm to School and Community Supported Agriculture(CSA) farm. Get your hands dirty in the fields, explore the rainforest, or just lay back and enjoy the slow pace of an active farm, off grid island style. Simple solar powered accommodations are only one part of your stay. *Rated “Top 25 New Favorites in the Caribbean” by ISLANDS Magazine! * See the November BEST issue. Note, staying on the farm is like glamping (Glamorous Camping). As a matter of fact you can camp if you preferred to bring your own tent! Cabanas are petite, screened in all around, ceiling fan and lights, simple beds, outdoor porch lounging area with outdoor sink. There's an outhouse close by in addition to the main Community Center bath house and regular toilets. The community center is the main shared kitchen for guests, providing all the basic amenities of a kitchen. Walking distance between community center/parking/bathhouse and the cabanas is about 3 minutes on uneven terrain. Anticipate wearing comfortable walking shoes and using headlamps when walking to and from your cabana. 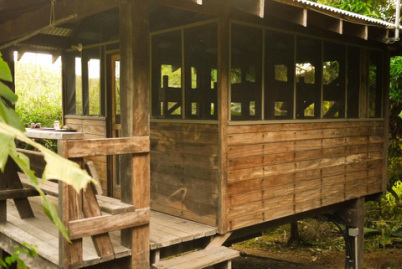 Minimum night stay: 3 Night minimum in the Bush! 1) Tent Camping: Bring your own tent: $35/night/2-person tent. 4) Groups: Group reservations, corporate team building, and custom programs in sustainability/organic farming, up to 35. Group volunteer discounts available. For group rates, please contact us directly to discuss how we can host your group. Staying at the farm is a transformational experience for groups, especially high school and college level. How would we describe staying at the farm for groups? Adventurous, off grid, sustainability focused, real, authentic, down to earth and in it, and will provide so many opportunities for life lessons in personal development. If you can remember that time growing up where you had an awakening of the world around you, the farm is that kind of place. Times: Check-in 2p-6pm. Check-out is noon. Click Here for a list of things to bring for individual farmstay travelers. Click here to Check out our recent Blog Post on R&R at R2R! Volunteer some time on the farm or don't. Your stay is on your pace. Our own brand of Beneficial Farming, for you to experience from spade to plate! It's really ALL ABOUT THE FOOD! Stay for a few nights, a week, or a season. Volunteer in the fields and gardens; feed the chickens and the pigs; stroll the property or hike to beautiful Annaly Bay, Sunset Beach, and the Danish sugar mills; visit historic Frederiksted, Christiansted, and the rest of St. Croix for a cultural and scenic island experience; or just relax knowing that your time here is helping to make this small fragile piece of the world a more sustainable place. We love our visitors and what you bring to this place! Click here to read about the Ridge to Reef concept that was recognized as a top ten place on the planet for saving water resources and cultural vitality among thousands of unique destinations.